When a Harrison Street resident got fed up with the neighborhood's rampant rat problem, she joined with other neighbors and the WBNA to work on a solution together. 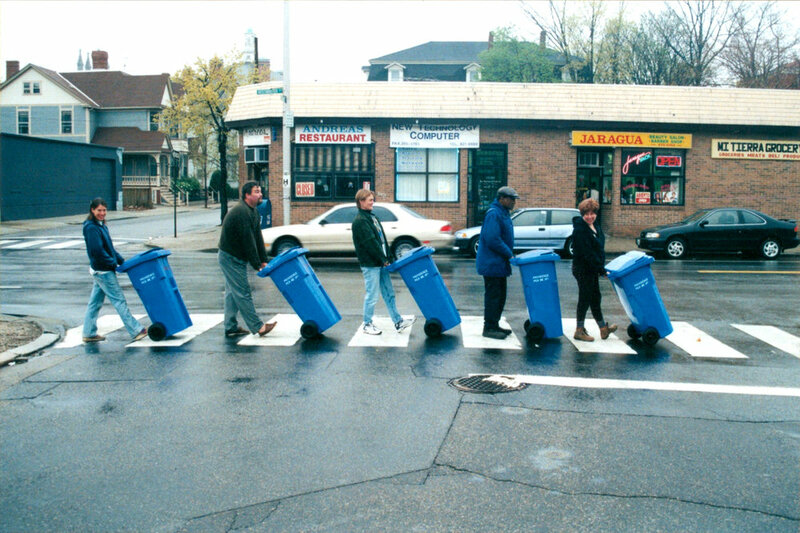 This community organizing effort led to the first rat-proof trash can pilot program in the City, which eventually adopted universal lidded trash bins for all Providence residents. In 1999 the rat problem on the West Side was epic. Residents used various kinds of trash containers – some lidded, some not – and often trash would not be contained at all. Empty lots were havens for these rodents, with junk piles and refuse providing safe nesting grounds for a rat population that found ample food in uncovered trash cans and whose numbers far exceeded the City's stray cat population. Harrison Street neighbor Karen Ziner faced this problem up-close when a neighbor noticed a few rat holes beneath her deck. Built low to the ground, the deck made for a perfect rat habitat. Ripping off the wood decking revealed evidence of a significant and guaranteed-to-grow rat colony burrowed beneath the structure. Overwhelmed by the fact that these creatures lived right up against the house and knowing that tackling a single colony would not address the endemic neighborhood situation, Ziner joined with neighbors and the West Broadway Neighborhood Association to explore a broader approach to the problem, resulting in a collectively organized “Rat-O-Rama." The first WBNA Rat-O-Rama Meeting featured a panel discussion with representatives from the Department of Health and Department of Public Works, pest control experts, and Mayor Vincent Cianci's aide Luke Driver. This meeting was the start of a collaborative, neighbor-led initiative lasting several years that eventually resulted in helping not only West Side residents but the City of Providence as a whole. Like many of WBNA's civic projects, the institution of rat-proof trash cans was slow and steady, involved multiple partners and collaborators, and was started by one neighbor who committed to seeing a project through to a solution. From preliminary discussions about the West Side's rat problem came a pledge by then Mayor Vincent A. Cianci to donate 175 thirty-three gallon trash bins with attached lids (a mini-version of what city residents use today) so that WBNA could roll out what would become a street-by-street pilot program starting in the Harrison, Hammond and Division Street area. The goal was to distribute free rat-proof containers to each and every household (renters and homeowners alike) on these contiguous streets and, eventually, to all parts of the neighborhood as grant funds became available. Educating residents was equally crucial. When picking up their barrels, residents received information sheets available in English, Spanish and Khmer about how to out-smart the rodents. Among the tips: remove potential shelter, water and food sources; keep yards free of brush, old tires and other potential nesting sites; and raise wood structures such as dog houses and decks at least 18 inches off the ground. While 175 trash barrels were a limited number in terms of scale, it was a start. After this initial distribution to neighbors in 2000, WBNA applied for multiple United Way and Citizens Bank grants that allowed for successive rounds of bulk trash container purchases. These second generation WBNA-branded bins were 45 gallons in size and were purchased – hundreds of them – with the help of Marc Gillson of locally owned Mt. Pleasant Hardware. All bins were provided free of charge to any neighbor living in the WBNA focus area, which at the time extended only as far east as Knight and Bridgham Streets. If you have a smaller bright blue-lidded trash bin or a dark blue trash barrel with a black lid, congratulations, you have a piece of history: one of the original WBNA rat-proof trash containers! At the turn of the millennium, cities across the country were experimenting with how to rid themselves of excessive rat populations. The Environmental Protection Agency had approved an eradication method called Integrated Pest Management which required the removal of sources of food, water and shelter for these rodents. Chicago had introduced lidded trash cans as a way to reduce the rats' food source and reported a fifty percent drop in its rat population as a result of using these containers. Rats and how to get rid of them were in the nation's collective consciousness, but it was the micro-level effort of West Side neighbors and WBNA that helped make it happen in Providence. When residents joined together to combat rats in the neighborhood, WBNA does what it often does when there's a problem: brings resources and people to the table – in this case, the City of Providence and other agencies and experts along with grant funders – to forge a solution. Through this project WBNA also met one of its strategic goals, to be a replicable model for others to follow. The City of Providence would eventually adopt a citywide program distributing 95 gallon rat-proof trash cans to all residents. But, because trucks and equipment used for trash pick up would need to be fitted to handle these larger bins, the program took many years to be fully implemented. In 2003 then-new Mayor David N. Cicilline asked Kari Lang, WBNA's Executive Director, to chair his Mayor's Neighborhood Council. Under Lang's leadership the MNC's first policy paper was written recommending rat-proof trash cans for every household in the City. Mayor Cicilline's citywide program would distribute approximately 60,000 rat-proof trash cans to Providence households over several years starting in Olneyville in 2005. WBNA is proud of the role it played in being a demonstration project for the City of Providence and applauds the active neighbors who led the charge. In addition to being a replicable model through the implementation of this project, WBNA also addressed its strategic goals of creating cleaner, safer streets, and of serving its diverse population of West Side residents.